(dishwasher, microwave, oven, cooking utensils, etc. ); 2 bedrooms (one with a double bed and one with two single beds), a bathroom (bath, shower, toilet). 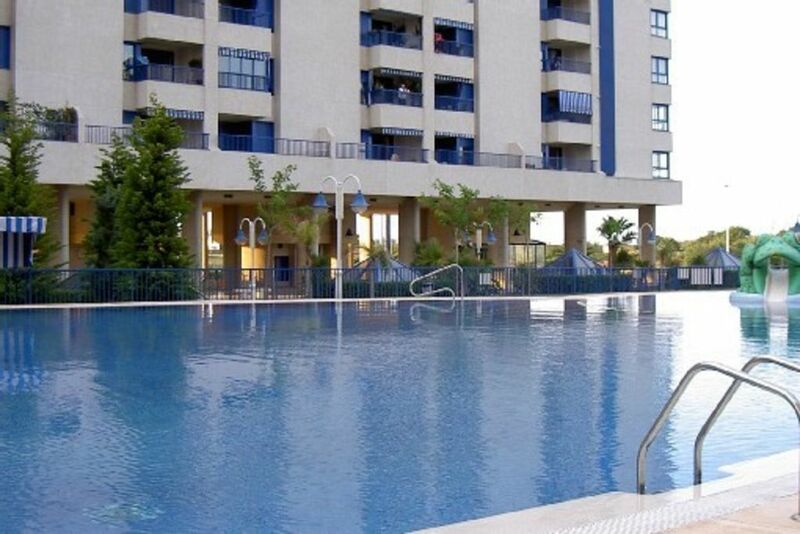 Has a monitoring system and a private parking, sports hall, tennis, swimming; conveniently located close to shopping. This residence offers a playground for children, mini-golf, Padel tennis courts and a gym, it also has a bar / restaurant available to residents with board games and a free Wifi access. The enclosure of the residence is closed, monitored 24h / 24 and only accesible to residents. Great apartment and location, would thoroughly recommend a stay. Great location very close to the beach and numerous beach side restaurants. The appointment was clean, tidy and plenty of space for just the two of us, would easily accommodate a family of four. Lo único que fue decepcionante fue que no había wifi dentro del apartamento. Bregamos porque hay wifi en el café pero se nos hizo un poco difícil coordinar con familia en valencia por causa de la falta de wifi. Lo de más estuvo espectacular. Gracias! Very nice apartment,had everything you needed for your comfort. There was a couple local cafes nearer our apartment..This could be a nice holiday area in the summer time.if a few more facilities were to open. We really enjoyed our stay at Carmen's. The condo was perfect for our needs, very clean and comfortable w/all we needed. We loved the condo complex, very nice, terrific pool and just across from the beach. Carmen was a great host and accommodating and all our needs were met. We would happily come back again. Nos llevamos muy buena impresión,apartamento limpio,cerca del mar y con plaza de garage. Para repetir . Estancia confortable en un entorno de lo más tranquilo. Estancia muy agradable salvo por el viento, circunstancia totalmente ajena a la propiedad. Tiene pequeños detalles que marcan la diferencia. La Sra. Carmen muy amable en todo momento cuando se ha mantenido contacto para cualquier duda. Propiedad recomendable 100%.